The very rare Golden Rod color and use of the Milk Glass Hobnail pattern on the exterior of a cased piece. This beautiful yellow glass had a very brief run in late 1956 and early 1957. It was very hard to maintain with the color varying from lighter to darker tones. The Beaded Melon pattern was used with most Golden Rod items. 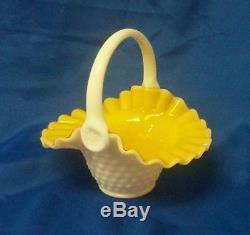 This unusual Basket has white milk glass hobnail on the outside with cased Golden Rod inside. It has an applied plain milk glass handle. It measures 7" high, 7" wide, is prelogo and is. In excellent condition with no chips, cracks or damage. We try to take pictures from several angles and also offer the close-up feature so you can look carefully at the piece for yourself. We welcome any questions and thank you for viewing our item. We'd like to invite you to visit our store, Town Square Emporium! And be sure to check our feedback. We are very proud of it and we workhard every day to deserve it. Auctiva offers Free Image Hosting and Editing. The item "RARE FENTON GLASS BASKET GOLDEN ROD OVER HOBNAIL MILK GLASS WOW" is in sale since Tuesday, May 15, 2018. This item is in the category "Pottery & Glass\Glass\Art Glass\North American\Fenton". The seller is "townsquaremike" and is located in Akron, Ohio. This item can be shipped worldwide.